Smokin’ Hot Pizza with his 32” conveyor oven produces pizza in mass quantities. 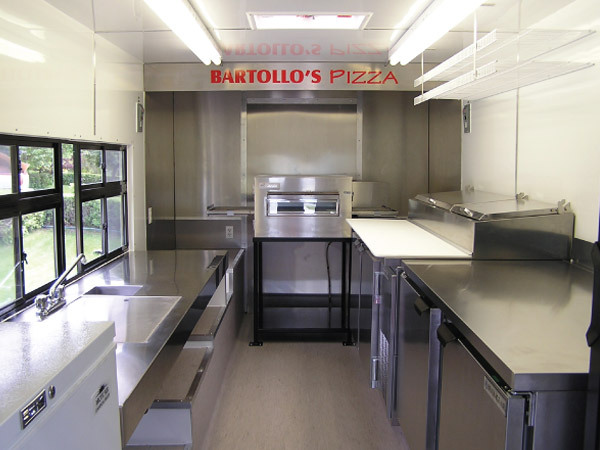 Bartollo’s Pizza operates in Kahnawake, Quebec, just minutes from Montreal. Brucci’s Pizza specializes in authentic Old World New York style cuisine. 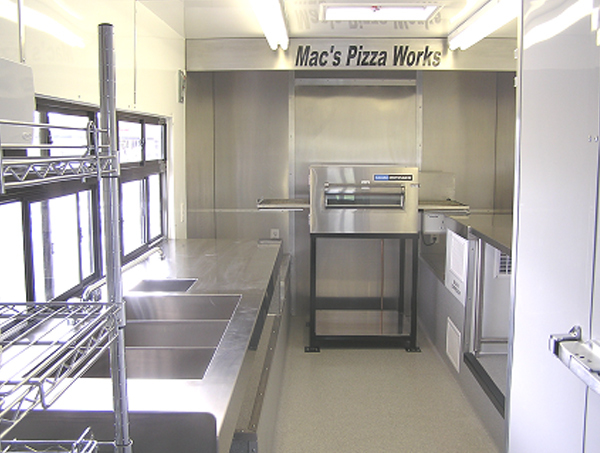 Mac’s Pizza operates in 3 smaller communities serving whole pizzas and pizza-by-the-slice. 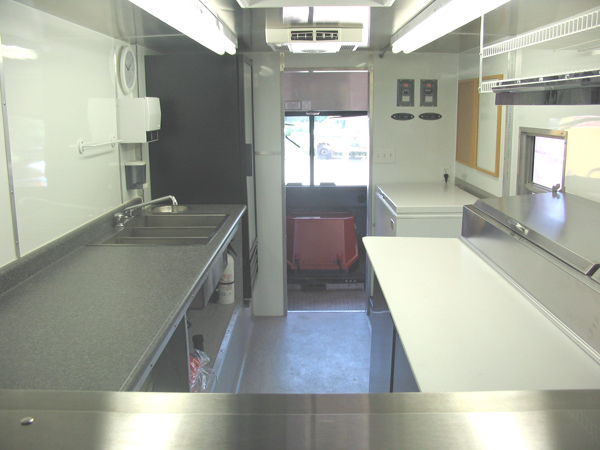 This unit has a built-in 4’ x 5’ walk-in cooler, 72” side-serving window, stainless steel sinks and counters, double exhaust, a/c, coved seamless flooring and powder-coated aluminum walls. 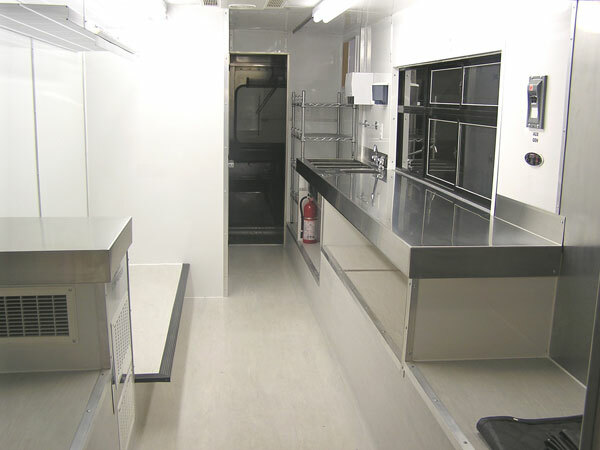 This unit is set up for pizza production and easy cleanup; it’s a health inspector’s dream. 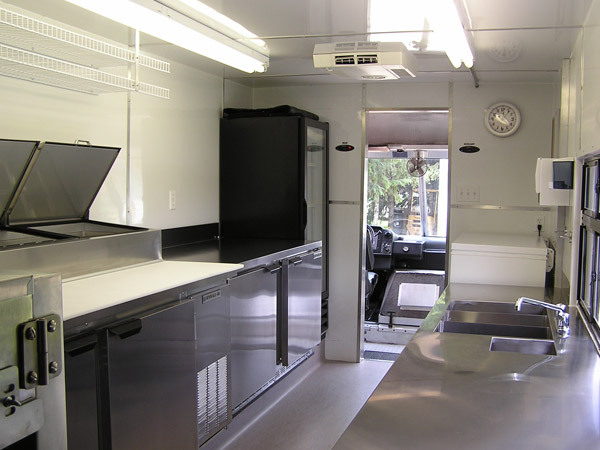 The customer, Old Town Pizzeria, is supplying his own conveyor ovens, a 72” pizza prep cooler, and hot food box. Old Town Pizzeria specializes in home delivery, events, and pizza-by-the-slice. 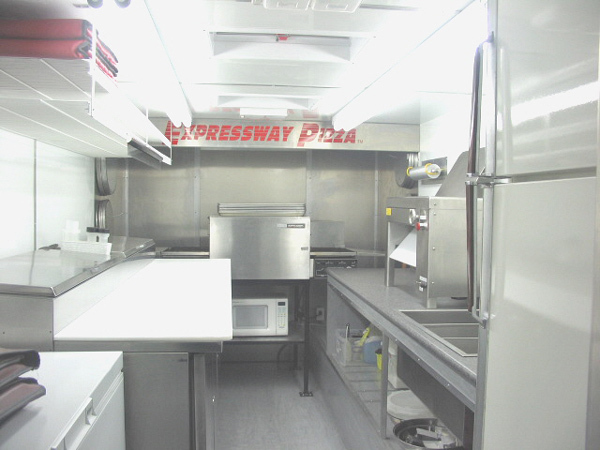 Expressway Pizza specializes in home and business delivery in rural areas. 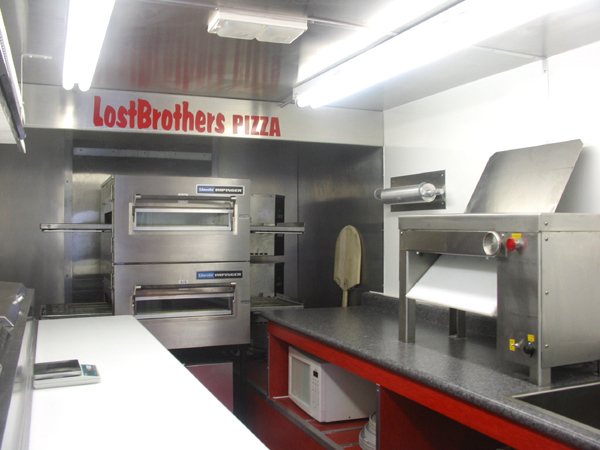 Lost Brothers specializes in on-site catering and pizza-by-the-slice in fixed locations. 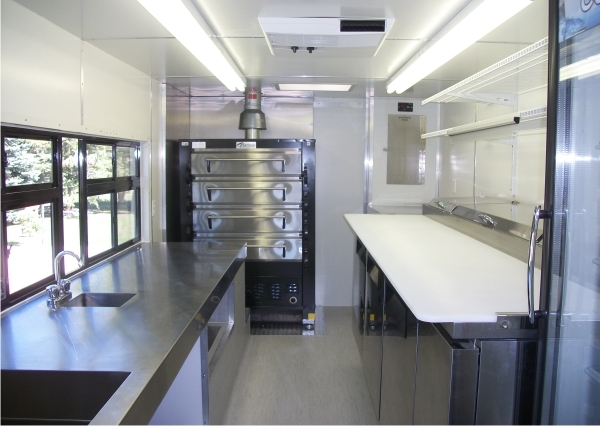 This truck specializes in on-site catering, special events, and business luncheons. 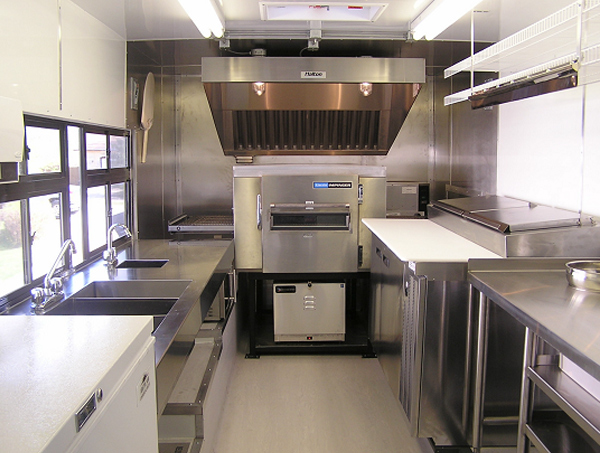 This truck specializes in on-site catering, special events and the late-night bar crowd. 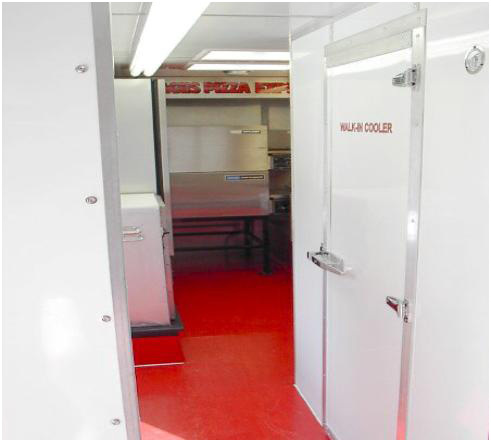 Village’s prepares their pizzas in their restaurants, are then loaded in the truck onto pizza racks, and stored in the walk-in cooler. 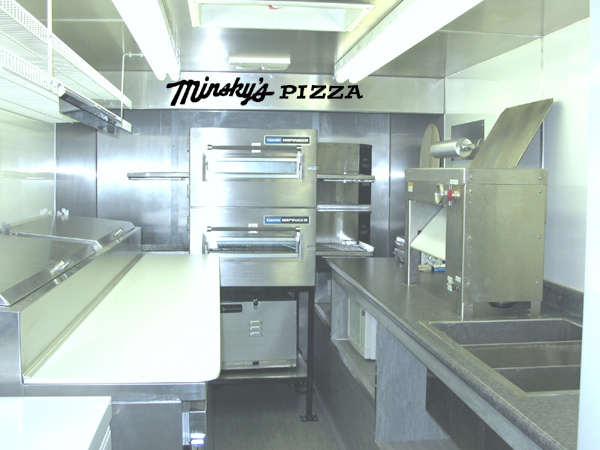 The pizzas are pulled out as required, proofed at room temperature, ran through the conveyor ovens, cut into slices, stored in the hot food box and served out the side window. 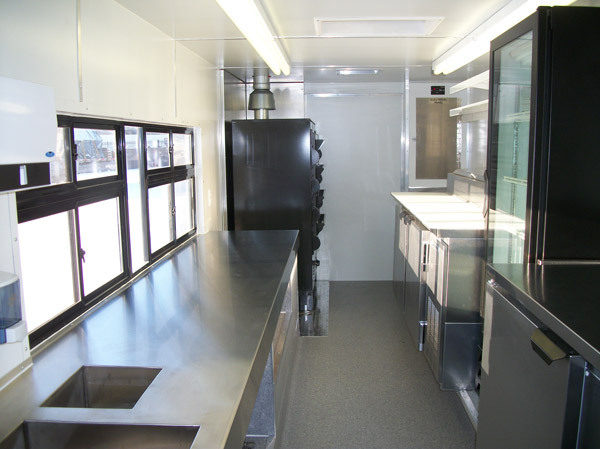 No more setting up portable kitchens under tents to do special events.